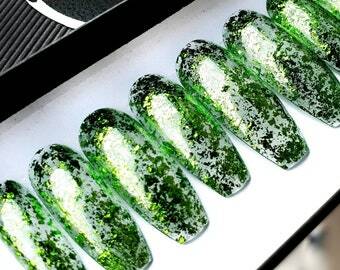 Salon quality luxury 10 press on nails. CHROME and pink press on nails. Stiletto shape in long length pictured. Hand painted by qualified nail tech, artistic person. 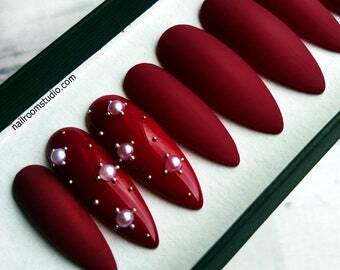 Choose shape: stiletto, coffin, almond, oval or square. If you order a CUSTOM SIZE please send me a note with your measurement. If you want different color, glossy or matte finish or you want to change something in this set please contact with me. Use a measuring tape (in centimeters) to measure your nails from one side of your nail bed to the other. Measure at the widest area. This is important to measure nails in both of your hands so you should notice 10 sizes. If you are not sure which size is better for your natural nail, for example: bigger or smaller I recommend the bigger, because you can file edges for perfect fit. Please notice that I need the time to process your order. Information about processing time you can find in FAQ on my Etsy website. 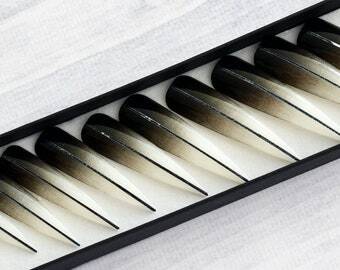 Truly elegant nails, can't wait to wear these babies. I was slightly disappointed to see they were Grey instead of Maybe but still absolutely beautiful nails. She did a great job as ND will order again. 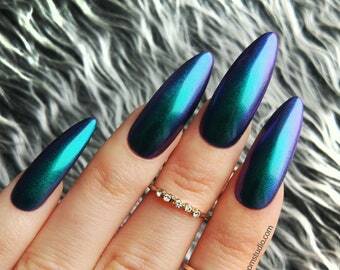 The nails are super beautiful and attention to detail is fantastic. The nails are simple yet classy and the bling on the cuticle area gives it extra pizzazz. Creation and shipping time was as the seller Iga advertises and she is also very sweet and respectable. I also love the box the nails came in and KITTY STICKER! <3 Thank you again Iga!! I ordered a custom design and these are the prettiest nails I've ever had! I was pleasantly surprised they turned out so beautiful. Planning the design went very smoothly and Iga was really helpful. Nails are very pretty & not cheap looking at all! 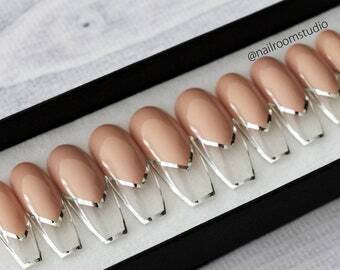 Can't wait to wear these nails. Experience was stressful, but nails are really pretty! If you have an idea for nails or seen something inspiring just send me a message. We can chat about your design together. All nails are made to order so may be customized. 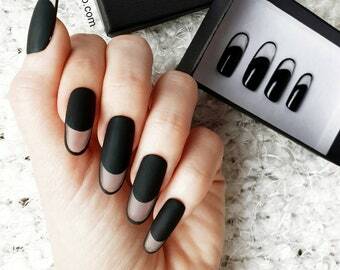 If you want to change something in nail set for example: different color, matte or glossy finish, other changes in design - please just make a note in the order. Every STANDARD SET include 10 nails in the size you select. FULL SET include 20 nails, two of each size 0-9. Nails comes in a box. If you use adhesive nail tabs your nails are reusable. You can wear them many times. 1. If you choose adhesive nail tabs you can wear your nails about 1 to 7 days. 2. If you choose nail glue nails stay on about 1 to 3 weeks (this is way to make salon quality hold like hard gel or acrylic). 3. If you prepare your natural nails well before application press on nails stay longer. International shipping is available for each country. Shipping cost depends on country. Please add products to cart and choose your country. That is the best way to calculate shipping costs. For all shipping methods you always get the tracking number. You can always track your parcel. Tracking is available for every shipping method. Processing time is separate from delivery time. We are not responsible for delays in delivery due to post problems. If you are not sure which size is better for your natural nail for example: bigger or smaller I recommend the bigger, because you can softly file edges for perfect fit. 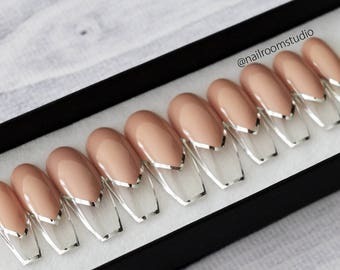 - ‌If you order more than one nail set your nails will be pack in the collective box. -‌We don't accept any changes within 5 hours after purchase. Any questions, suggestion, clues and every comments please sent when you placing an order or a while after. 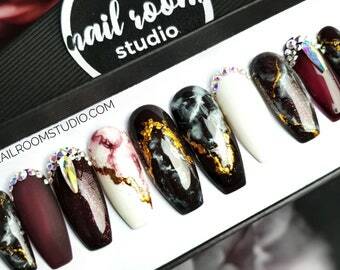 Burgundy custom press on nails with white marble accents, gold foil and genuine crystals. 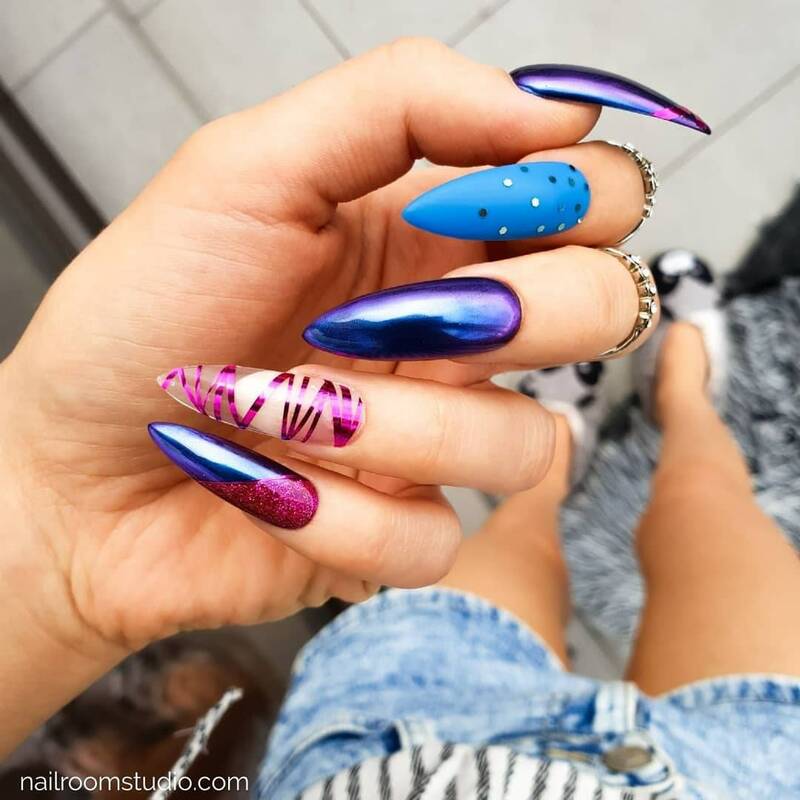 Hand painted glue on nails | long short stiletto..